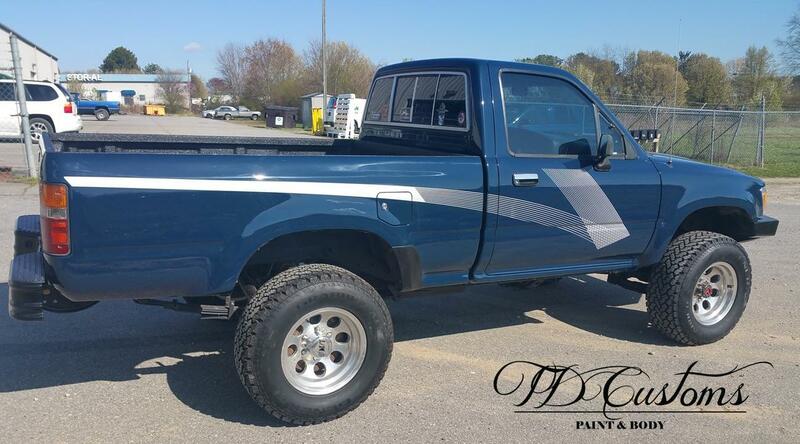 One of the recent paint jobs we did was a ’90 Toyota Tacoma pickup truck. The truck was being done for a soldier overseas in the military. 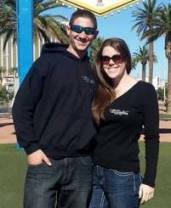 We were able to communicate with him via phone and email, and his parents brought and picked up the truck. He’s seen pictures of the finished product, and is excited to have a beautiful, redone truck to come home to. We did a full exterior restoration and factory-original paint job on this one. There was body work that needed to be done, as well as some rust repair on the body and the frame. For the frame, we repaired the rust and applied an anti-rust undercoating to the entire underneath of the truck. There was a complex checkmark type decal applied to the Tacomas in 1990. We had the exact decal ordered, and it came to us in four pieces. We needed to line them up and apply them to the side of the truck. 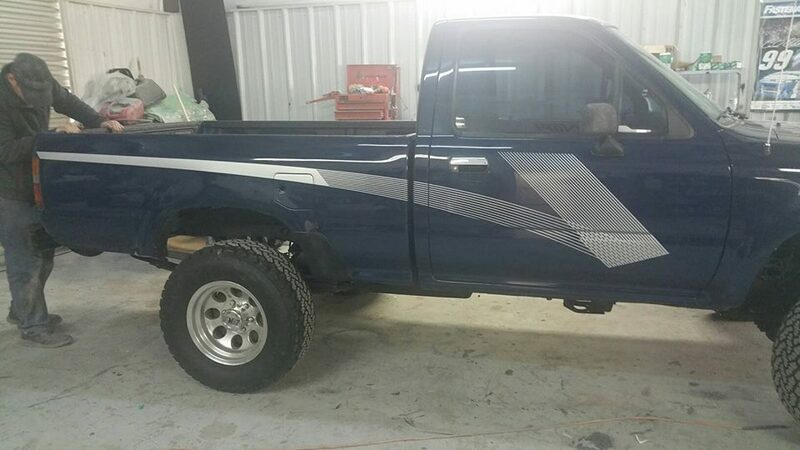 It took careful application to make sure the decal was in the perfect spot, lining up with the body lines of the truck, with no bubbles or blemishes. Using a spray bottle of soapy water, we were able to lay it flat on the truck and position it where it needed to be. The check mark decals were applied to both sides of the truck, and really adds an eye-catching element. We replaced the front windshield and the door seals that were rotted. 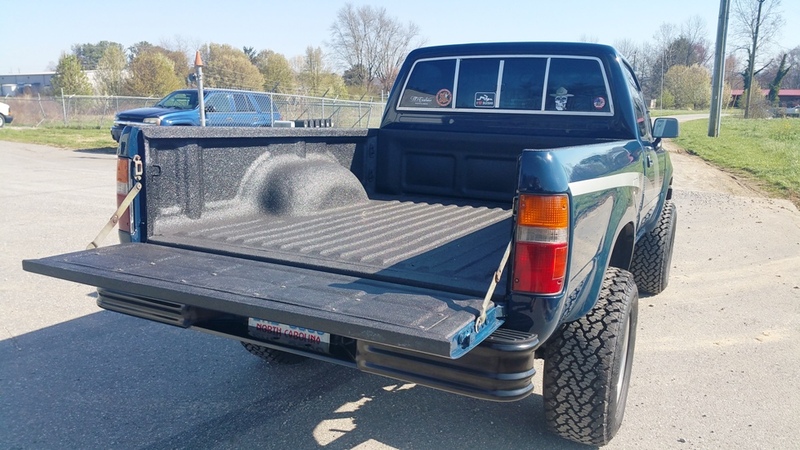 We also had a very durable, long-lasting bedliner Line-X bedliner applied to the truck bed. 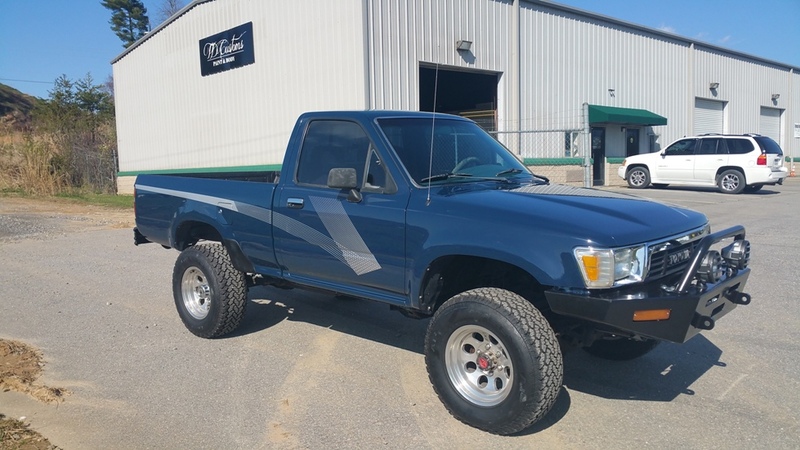 The Tacoma was refinished and painted back to its factory-original paint color; a dark blue. The WARN grille guard was added as a custom touch to the front end. 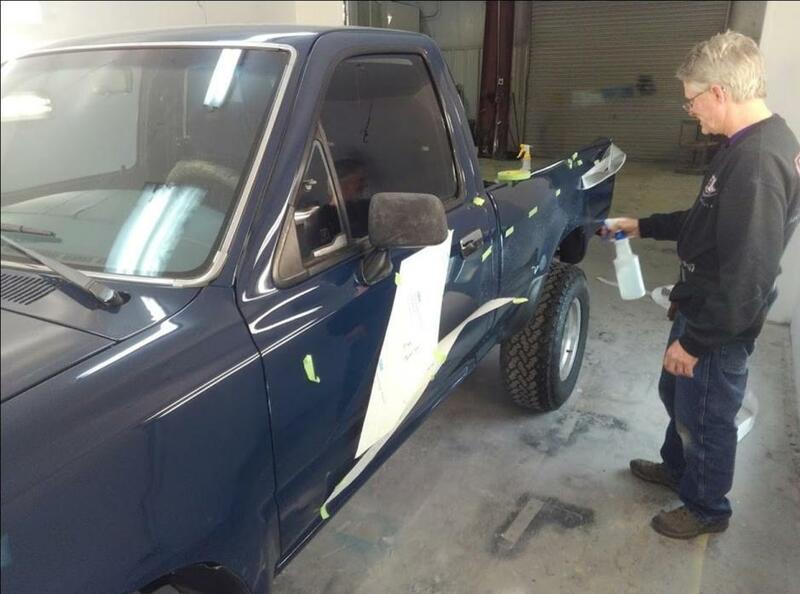 Whether you’re looking for a full restoration or a simple paint job, TD Customs is the place to customize your vehicle. We’ll have it looking brand new in no time. 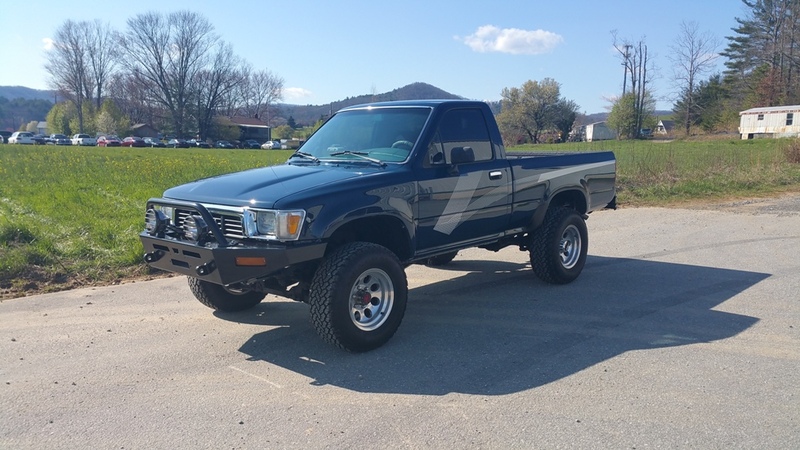 Many customers prefer the factory original restorations that bring the truck back to its former glory and nostalgic look. Others prefer to modify the original look and choose all new colors. The choice is yours! Contact us to discuss your next paint job. We’re happy to help with any refinishing project you have. 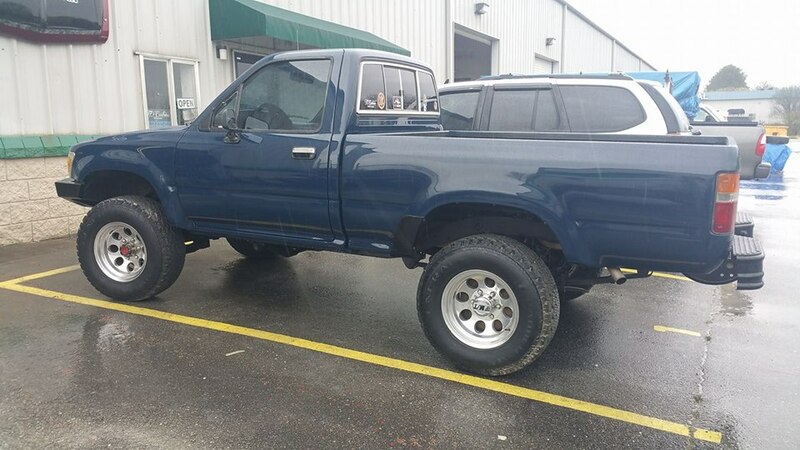 No Replies to "'90 Tacoma Refinished to Original Paint"